Primer #23 comes from the extraordinary House Of Dior. The name brings to mind, to me, the revolutionary fashions of the post-war era, the Christian Dior "New Look," with belted wasp-waists and full petticoated skirts, and those bows. Those gorgeous Dior bows. I think Christian Dior truly loved women. 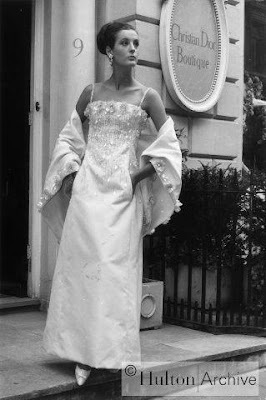 Twenty-five years after the New Look changed the shape of women's fashions forever, I went in search of a wedding dress with a Dior bow at the waist. I did not find one. But just this past month, Charlize Theron appeared on the red carpet in a beautiful Dior navy-blue dress, complete with the signature bow at the shoulder. You may not have liked it, but I swooned. Dior perfection, elegance, back again, tied with a bow. I loved all things Dior from the moment I learned about the bow. I love the cosmetic line that bears his name. And so today's primer is Christian Dior Diorskin Base De Teint Moisturizing Radiance Fixing Makeup Base. This milky-pink liquid reveals an iridescent pinky-peach shade when applied to the face, and definitely has a slight whitening effect. It smooths on evenly with a pretty, dewy finish, and the kind of luminosity that these pearly primers give. There is not a silicone-pore-and-line filling effect, but the light-reflective properties of this primer definitely soften any imperfections. I've actually worn this primer all by itself on many occasions, just for the luminous, dewy effect. Under my La Prairie Concealer Foundation, this primer grips like almost no other. It adds no weight or thickness, but it has a tenacious 'grab' that makes any foundation last all day without cracks, uneven wear, color change, or oily breakthrough. It did seem to make my usually creamy La Prairie seem just a tad over onto the matte side, but I did not mind, because the primer itself kept my complexion glowing without looking shiny. There is a slight scent to this primer, as most other Dior products have. It's not offensive to me, but I need to report when products have a scent to them. The best quality of this primer is the 'grab' effect. If you do not want your foundation to budge until you decide to remove it at the end of the day, this is the primer to try. So go off to the Dior counter where you will find the navy-blue packaging, elegant, womanly, worthy of the name Dior. Wear a bow in his honor.